Hummocks are where the roadway asphalt has pushed up in a wave-like shape. They are commonly located at intersections where there is heavy truck or bus traffic. DOT typically follows up with spot milling and paving, which may performed during the nonpaving season, from mid-December to mid-March. To report a hummock, call 311. Ponding is when water pools at low points in the roadway, generally as a result of inadequate drainage or improper grading. Report ponding to DEP by calling 311. Report missing manhole covers to DEP by calling 311. 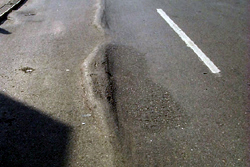 Defective street cut restoration is when the street surface is no longer level because a filled-in cut has sunken one inch or more or been mounded too high. Street cuts are usually square or rectangular in shape. Typically, a DOT inspector will review the defect. If actionable, the inspector will issue a corrective action report to the party that performed the street cut, including to other city agencies. If the responsible party cannot be identified, DOT will perform the repair. Report a failed street cut or old utility cut See a list of protected streets (no cuts allowed except for emergency work or as authorized by the Commissioner). Find out who holds a permit to conduct street construction in your neighborhood. Order a copy of the current edition of the New York City Truck Route Map through the mail. 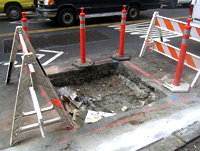 After finishing street work, permittees are required to restore all street openings and excavations. Report a Backfill, Base or Wearing Course. The construction industry and government agencies must apply for permits to perform roadway, building and sidewalk construction on City streets and non-toll bridges. DOT's Street Works Manual has complete information on street construction permits Permitees can check the status of active street construction permits throughout New York City. The Adopt-A-Highway program is a tax-deductible opportunity for proud New Yorkers to give back to their community by ensuring clean and beautiful roadways in the New York City area. Learn more about the Adopt a Highway Program.